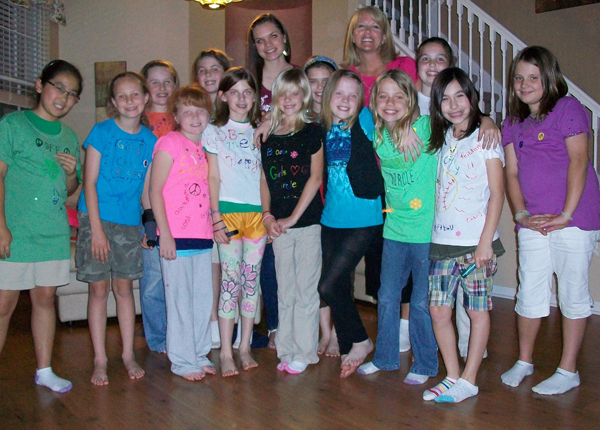 Nancy Lemon and Lisa Aber are accompanied by local middle school-aged girls during a recently held workshop. The duo scheduled to host a mother-daughter workshop to help forge a better relationship in the coming years that are so critical in a girl's life. To promote a healthy and sustaining bond between mothers and daughters during the transitional years from girlhood to young womanhood, certified Girls Circle facilitators, Nancy Lemon and Lisa Aber were pleased to announce the hosting of an upcoming Girls Circle Mother/Daughter workshop later this month. “Our goal is to encourage, inspire and re-inspire their bonds of connection in practical, honest and enjoyable ways,” Aber said, adding that the intention of the workshop is to promote girls’ healthy and safe development into womanhood. Aber also explained that the appropriately named “Heart of the Matter” eight-week-long program, which is specifically being offered for both fifth and sixth grade girls and their mothers, intends to give both the mothers and daughters tools to sustain and improve their relationships in the areas of communication, security, trust and confidence. The workshop includes facilitated discussions to help build stronger communication and strengthen relationships, while learning how to promote traits such as empathy, identify relationship accountability and experience affirmation together. Adding to the importance of the program, Lemon emphasized that the mothers and daughter relationship changes as the child grows. “This fun and meaningful workshop will help forge a better relationship in the coming years that are so critical in a girl’s life,” Lemon said, adding that the course is based on the Girls Circle Mother Daughter curriculum, a research-based program with scientific data to back up the material and its successes. The workshop is scheduled to begin on Thursday, April 14, from 6-8 p.m. at the Osprey Observer Small Business Center, located at 900 Lithia Pinecrest Rd., and is scheduled for every week on Thursday except on week two, when the workshop will meet on Wednesday, April 20. The last class is scheduled for Thursday, June 9. The workshop cost $249 with registration now available. Those interested in reserving a space can e-mail to confirm and send in their registration and payment made out to Professional Development Group, c/o Nancy Lemon, 16903 Falconridge Rd. in Lithia. Nancy can be reached at either 571-2002 or nancy@pdginternational.com.